2015-December-2: Exploring Geodesy and Geomatics Lecture Series: Data Science in Geomatics. Details. 2015-November-23: TME Lunch and Learn presents Dave Coleman: An Entrepreneurial Journey, at 12:30 PM in H224. 2015-November-19: Tulloch Engineering will give a presentation at 2:30 PM in E-4, with interviews to follow. Details. 2015-November-19: GGE Graduate Student Seminar. Details. 2015-November-18: Exploring Geodesy and Geomatics Lecture Series: An Internship at Mzuzu University in Malawi. Details. 2015-November-17: McElhanney will give a presentation at 8:30 AM in E-4, with interviews to follow. 2015-November-5: Amir Abouhamzeh defends his M.Sc.E. thesis at 9:30 AM in E-13. Details. 2015-November-4: Special guest lecture by Dr. Jennifer Wozencraft, U.S. Army Corps of Engineers. Details. 2015-October-27: Oluwatimilehin Shodimu defends his M.Sc.E. thesis at 3:30 PM in E-11. Details. 2015-October-19: Special guest lecture by Associate Professor Vassilis Gikas from the National Technical University of Athens, Greece. Details. 2015-October-19: Presentation by McElhanney Consulting at 5:30 PM in E-4. Details. 2015-September-23: WSP will give a presentation at 4:30 PM in E-4. Details. 2015-August-31: Jaime Leon defends his M.Sc.E. thesis at 11:00 AM in E-11. Details. 2015-August-27: Zhongwei Huang defends his M.Sc.E. thesis at 2:00 PM in E-11. Details. 2015-August-7: Michael Klu defends his M.Sc.E. thesis at 2:00 PM in E-11. Details. 2015-July-3: Sina Adham-Khiabani defends his Ph.D. dissertation at 10:00 AM in E-13. Details. 2015-June-24: Shabnam Jabari defends her Ph.D. dissertation at 1:00 PM in E-13. Details. 2015-June-5: Anand Hiroji presents his Ph.D. dissertation proposal at 10:00 AM in E-11. Details. 2015-May-27: Danar Pratomo presents his Ph.D. dissertation proposal at 10:00 AM in E-11. Details. 2015-May-26: Douglas Pereira defends his M.Sc.E. thesis at 9:00 AM. Details. 2015-March-25: GGE Graduate Student Technical Conference. Details. 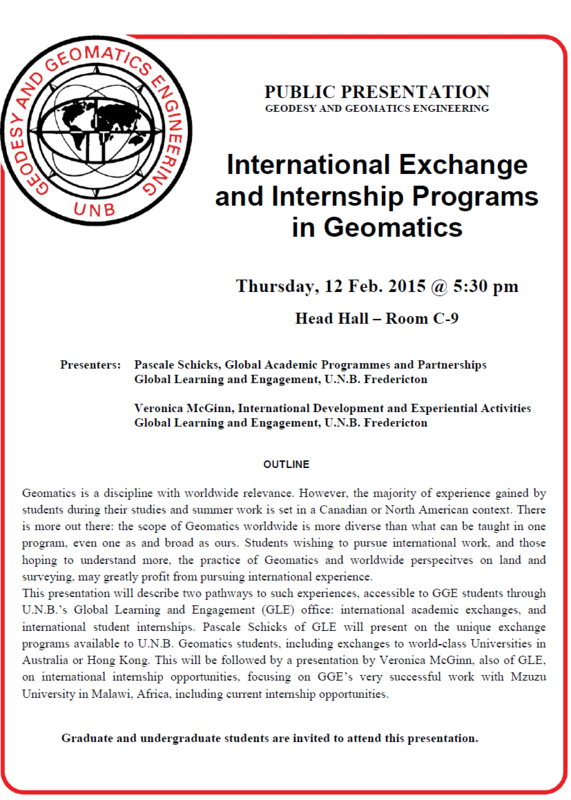 2015-February-12: Presentation on international exchange and internship programs in Geomatics at 5:30 PM in C-9. Details. 2015-February-4: Sabarish Muthu defends his M.Sc.E. thesis at 4:00 PM in E-11. Details. Recruitment Visit by MMM Group Ltd.
2015-January-29: MMM Group Ltd. will give a presentation at 12:30 PM in E-4, with interviews to follow. 2015-January-26: Challenger Geomatics will give a presentation at 9:00 AM in E-4, with interviews to follow. 2015-January-15: WSP will give a presentation at 11:30 AM in E-4. 2015-January-12: Schlumberger will give a presentation at 12:30 PM in E-4. Details. More.